Baseball-themed console games have long included a home run derby mode for quick bursts of play and instant gratification, and as this is pretty much the modus operandi of mobile gaming, it’s no wonder that someone came up with an app for it. Homerun Battle 3D for iPad, from Com2uS, is fun and easy to play whether you’re interested in baseball or not. Homerun Battle 3D turns the basic home run derby into a fully interactive game, with three different modes, a customizable player, and a multidimensional profile and leader board component. To keep things simple, though, the only skills necessary are a steady hand and a little coordination. An illuminated oval shows where your avatar is aiming, so all you have to do is tilt the iPad until the ball lines up with your aim. You then tap the screen anywhere to hit, aiming to knock it out of the park every time. It takes a little while to learn the correct amount of movement necessary to hit the ball at the right angle, but it’s very straightforward. Training mode explains the game’s concept and controls, so once you’ve figured it all out, you can move on to one of three different game modes. Classic is the most basic, where the pitcher throws standard fastballs and you accumulate outs for every hit that isn’t a home run. Arcade mode is a little more forgiving, but also more challenging. The pitcher adds curveballs, screwballs, and changeups to his throwing, making it much harder to anticipate where the ball is going to cross the plate and therefore to where you should tilt your aim. However, the benefit of Arcade mode is that every hit gains points, including extra points for smashing into the Jumbotron or bouncing off of foul poles. Finally there is Matchup mode, which puts you head-to-head with other players through an Internet connection. In a split screen, you race each other to see who can score 3000 points first. In all three modes you accumulate points toward Gold Balls—Homerun 3D’s currency. You can use Gold Balls in your profile under the Slugger section, to customize your avatar with everything from your choice of hair and eye color to a leopard print jersey and a flame-decaled batting helmet. Points also move you up in your game rankings, earning you a seemingly infinite number of titles from Rookie to Home Run Machine to the ultimate: Celebrity. All of your stats and scores are neatly organized in the Slugger section—should you be interested in tracking your progress. Those hoping that the advent of the iPad would compel developers to upgrade their graphics to lifelike quality might be disappointed, because Homerun Battle 3D looks decidedly like the old school baseball games that inspired it. But the colors are bright and the scenery is detailed, so it’s probably just a style choice. 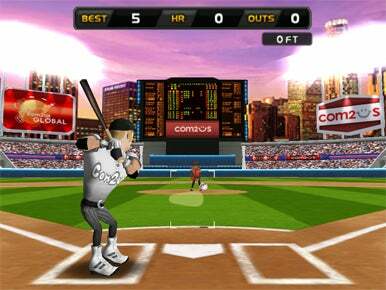 Homerun Battle 3D for iPad is a simple game with endless replayability and a sense of humor about itself. And – at just $5 – a great deal as well.